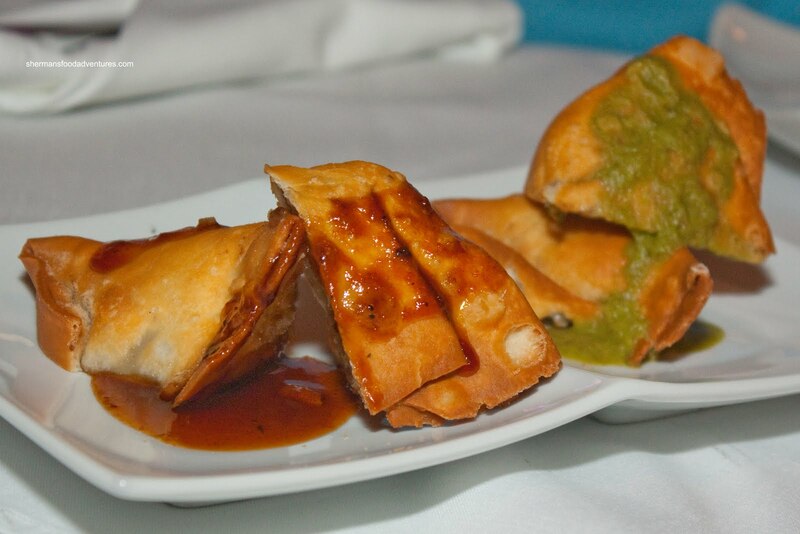 As a table, we decided to share a couple orders of Samosas to start. They split them up for us since we had 7 people at the table. This maybe a bit nitpicking; but we would've preferred the tamarind chutney and cilantro sauce to be served on the side rather than directly on the samosa. As for the samosas, they were fried until crisp with a soft potato filling which had an underlying heat. I personally like the tamarind chutney more since it has a nice zing to it. In this case, the cilantro sauce was quite flavourful where it actually had a pronounced chili pepper kick. I was not satisfied sharing samosa's and also ordered a Chili Gobi. 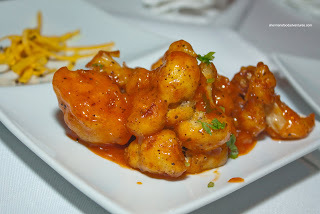 This consisted of lightly battered and fried cauliflower tossed in a sweet chili sauce. Not too dissimilar to a Thai sweet chili, this one had more kick to it. The cauliflower was perfect - cooked all-the-way through while still crispy outside. Everyone at the table universally liked this appy and would gladly order it for themselves if they had the chance. Milhouse was famished. So just like me, he got an appy all for himself. I was secretly hoping he would do so and also, I was routing for the Frankie. As if he had telepathic abilities, he did order it. 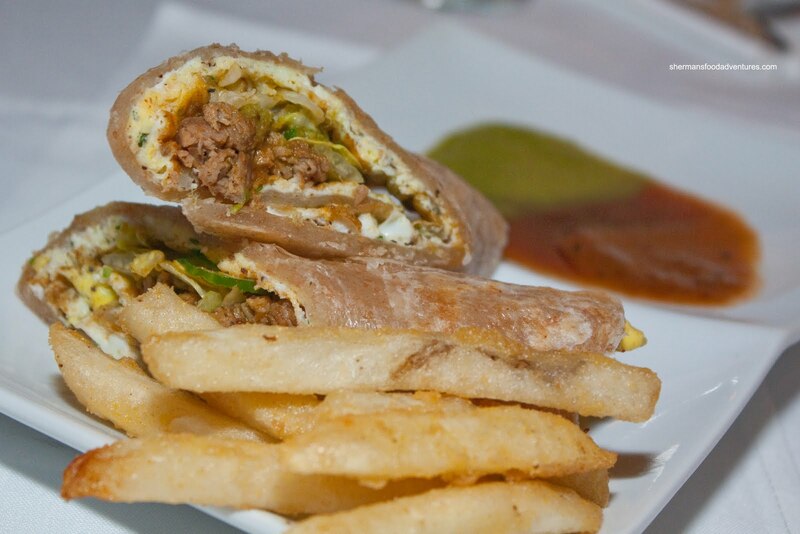 Looking almost like a Taiwanese pancake roll, the Frankie consisted of egg, lamb curry and cucumber. It was accompanied by the same cilantro sauce and tamarind chutney (and a few fries). Now this particular item is one of the specialties and I wouldn't go as far as to rave about it; however, it was quite good nonetheless. I found the wrap to be soft and easy to eat while the lamb was tender and well spiced. With the appies out of the way, we all had our own entrees. To my horror, both Miss Y and Judes had the Butter Chicken. Duplicates! Anyways, the butter chicken was um... "different". It was rather sweet and didn't have any other distinguishing flavours. We felt more tomato paste was needed. There was, however, lots of tender white meat. Now duplicates was bad enough. Try triplicates! To my utter shock Bear, Milhouse and Hot Chocolate all had the Lamb Palak. If Mijune was here, she would've put them in their place! This was really thick and in somewhat of a smaller portion compared to all the other dishes (even with the sauces taken into account). Despite this, it was full of tender pieces of lamb and was quite filling in the end. The flavours were quite muted which suited most people quite fine. 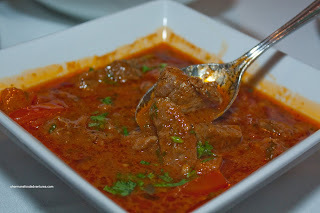 Boss Woman mercifully had something different in the Railway Station Curry with lamb, tomatoes and cilantro. This was also a very mild offering which didn't mean it wasn't good. The flavours were just muted (which I'm sure tailored to the prevailing clientele). 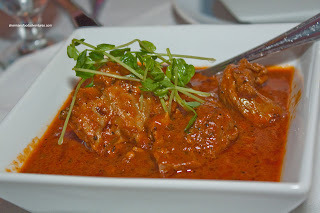 Other than the muted flavours, the lamb was plentiful and moist while there was plenty of tomato goodness. For myself, I had the Punjabi Style Goat in light tomato & cilantro curry. Even though the ingredients seem similar to the Railway Station Curry, the flavours were much more prominent. 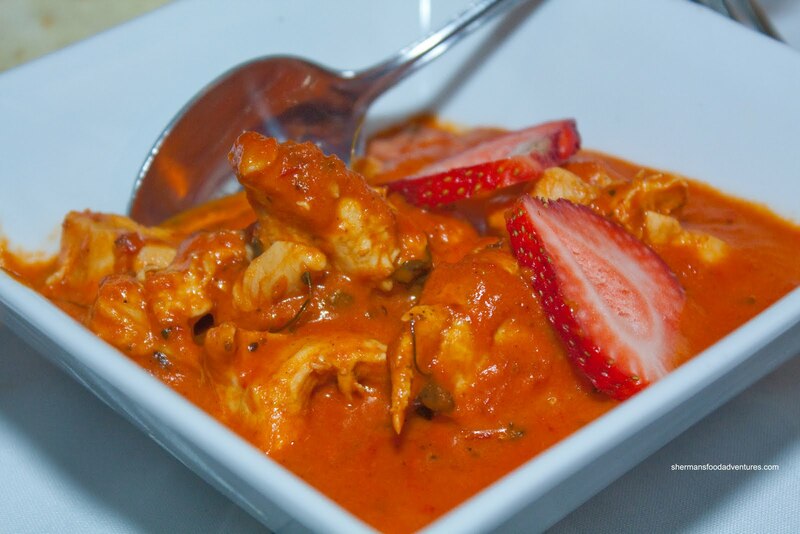 There was a certain richness that highlighted the ingredients, particularly the tomato. Moreover, a certain level of spice made itself known without being offensive. Coupled with large pieces of moist, tender goat, this was probably the best dish at the table. Miss Y and Boss Woman kept returning to the sauce and ignoring their own dishes. A good sign. Now all of our meals included rice and Naan. 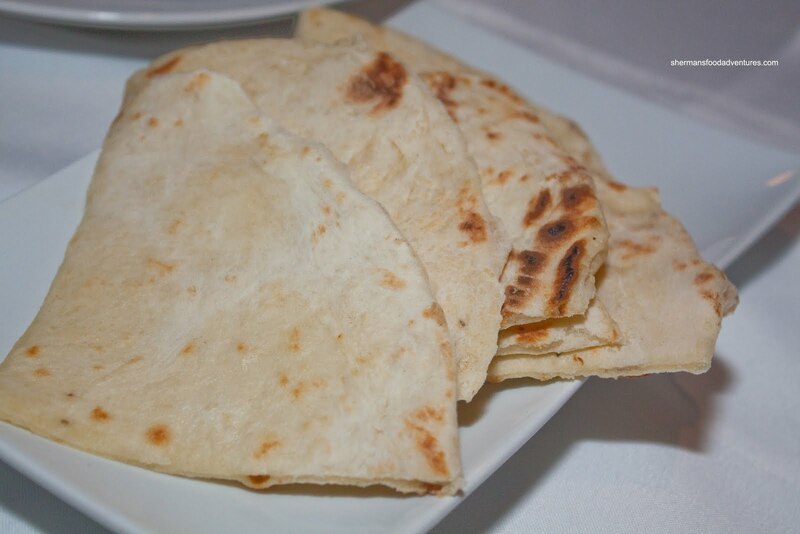 The naan was was quite pale and doughy. They probably didn't have a tandoor on-site which would greatly hinder their abilities to pump out really good naan. With that being said, I've had decent naan cooked without the use of a tandoor as well. One side note is that we ran out of naan partway through our meal and we were offered more naan. We were never notified of the extra charge for the naan. To be fair, we would've been fine with the charge since it was negligible. It just would've been nice to know ahead of time. 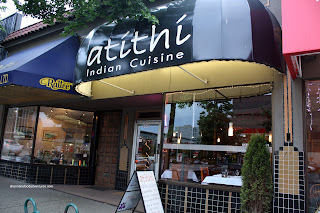 Despite all of our reservations about the muted flavours at Atithi, we still enjoyed our meal. In all fairness, a restaurant is only there to satisfy the majority of diners. Hence, our expectations were not unreasonable considering the location. It is nowhere near Main Street nor Surrey. With that taken in consideration, the meal as a whole was alright and reasonably-priced. OMG SHERMAN!! We posted our visits on the same day and we didn't even go together!!! have you read our intros?!?! We said the same thing!!! I haven't read the rest of your post yet... but I had to get that out of my system first! LOL!! I sure would have "out them in their place" bahahahh! ok... why is my comment linking to my old blog?? anyways yes the reson why flavours are more muted and you probably thought it wasn't as rich is that it's intentional and chef said it's much more homestyle than "reaturant"...I don't know.. that's what I was told. 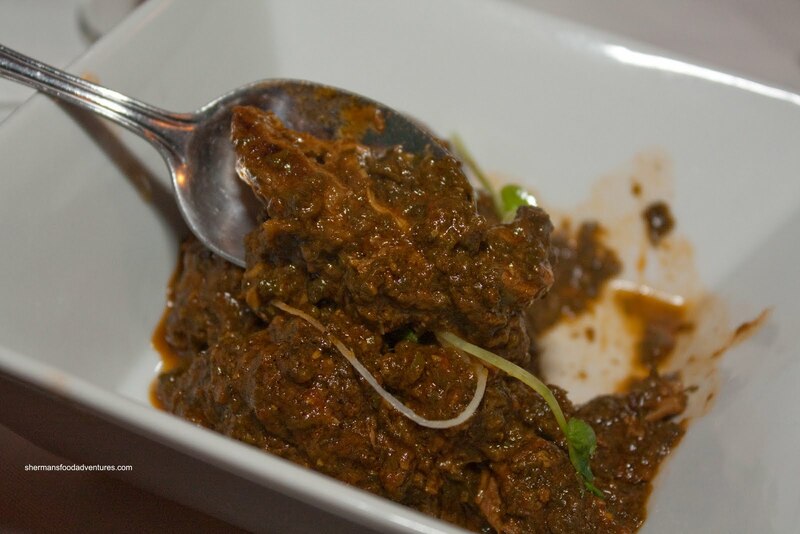 I REALLY wanted to try that goat curry!!!! Boo!! next time I'll have too.